The role of the Trade Related Aspects of Intellectual Property Rights (TRIPS) agreement, within the public health landscape of African states cannot be understood as a static image. Rather, TRIPS is about transformations. In the previous chapters, I have introduced some of these transformations as enacted through the movements generated by the implementation of TRIPS – or at times, their unexpected lack of movement. I have then questioned how the influence of pharmaceutical patents can be explored aside from their role as legal regulation, through their action within markets, and in particular in markets that are still heavily influenced by past and current forms of imperialism. Here, I reflect on the changes, innovations and transformations that have occurred within the public health context of Djibouti and Ghana in recent years, and in particular those that can be viewed as a reflection of the broader movements generated by TRIPS at the global level. My starting point here is that TRIPS can only be explored fully if we also engage with the various global movements that is has produced or been entangled with. 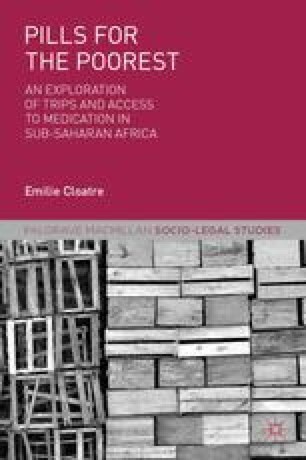 The analysis provided in Chapter 2 is built upon in this chapter, and I start from the understanding of TRIPS as a complex assemblage that has come to produce and become entangled into the access to medicines campaign and its different effects. I explore two main issues here: first, I look at some of ways in which medicines and diseases have become reshaped in Ghana and Djibouti following the new global emphasis on access to affordable medicines. I then turn specifically to AIDS, as a site in which the complexity of the coproductive processes linking TRIPS and disease can be explored in more specific depth. I argue throughout that these movements and transformations need to be considered carefully if we wish to understand the full extent of the relationship between public health and intellectual property (IP). This approach is both informed by my theoretical conceptualization of TRIPS and by the entanglement of TRIPS, IP and recent global programmes in the discourses of participants to this research. In their views, discussions of IP were inherently linked to a broader questioning of the movements that animate the landscape of disease and treatment that they engaged with on a day-to-day basis. TRIPS is an event that happens in many places, that generates changes in many networks, that is embedded in multiple actions and practices, and, in order to understand what it ‘does’ in Djibouti or in Ghana, it is essential to have a clearer idea of the effects it has in these many other places, and the indirect repercussions this has on these localized contexts.